The quilting itself was quite another story. The borders were done in a plain meander and were definitely the easiest part of the quilting. I had originally intended on doing a ribbon meander, just because it looks so pretty. But, when I did the first meander pass, I realized that the black thread absolutely *disappeared* into the print. *I* couldn't even see it when I was quilting! There was no way I was going to spend time doing a ribbon meander (or anything else even vaguely fancy) when it wasn't going to be seen. However, because of the scale of the strip sets ... the squares of the Irish Chain are 2" .. the blocks just HUGE. But, this was necessary because of the size of the pre-printed butterfly panels. The final size of the blocks (Irish Chain and butterfly blocks) was 22" square. That's just HUGE. Did I mention that the scale of this quilt is just HUGE?? Unfortunately, Lizzie's workspace is not 22". I couldn't fit an entire block in Lizzie's workspace. The picture to the right shows, in red, Lizzie's workspace versus the entire Irish Chain Block. You can immediately see my dilemma. The quilting design I was using was a free-form, swirly-curly, kinda/sorta, almost feather design (is that vague enough??? ), which is forgiving in that there is no set pattern to it. BUT, it was the first time I was doing it and free-form designs are a little outside my comfort zone. To give myself a little bit of structure, I chalked in the spine for each of the feather-things. This made is a tad less intimidating to work the area, as well as making sure that the quilting would be evenly distributed. I wasn't sure that 1) I was doing a good enough job or 2) if I really even liked it. But by the time the first Triple Irish Chain block was done, I was committed to doing the rest of the blocks that way because I was NOT going to rip the stitches out! 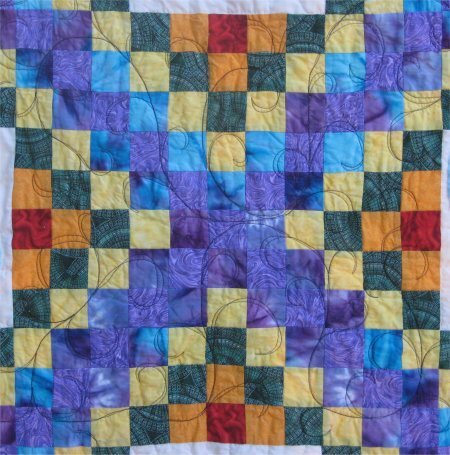 Inspiration for the Irish Chain quilting came from a freely downloadable PDF from Patsy Thompson Designs: Free motion fun with vines and leaves, Vol 2. But ... don't advance the quilt yet! The butterfly blocks which were skipped over need to be done first! That means a thread color change from black to white. 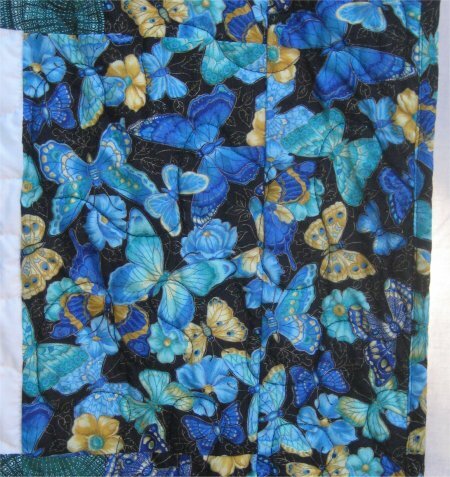 The butterflies had a stitch in the ditch around the applique. I'm getting "better" at this but by no means terrific. Staying a consistent distance from the edge of the applique is doggone difficult, even with the tools I have to help me! 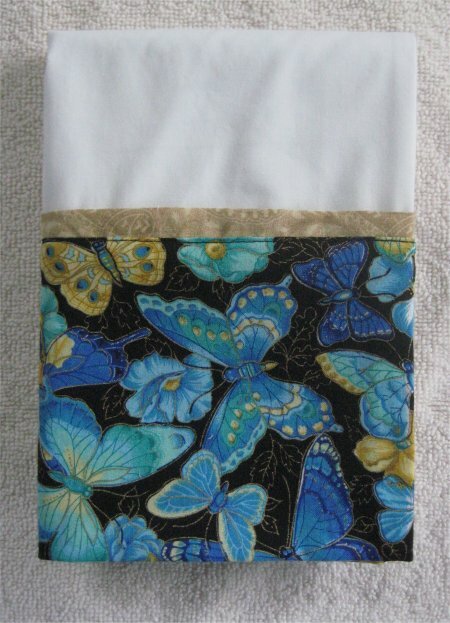 The stitch in the ditch was necessary to stabilize the very big area of the butterfly applique perimeter. 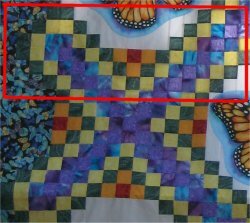 To hold down the background of the butterfly block, I had originally intended on doing echo quilting .. duplicating the edge of the applique. My first attempt was SO UTTERLY DISMAL that I ripped the whole thing out, sat down and re-thought the entire process. Echo quilting was right out. I don't have the correct technique for it. Furthermore, I haven't a clue *how* to do reasonable echo quilting. 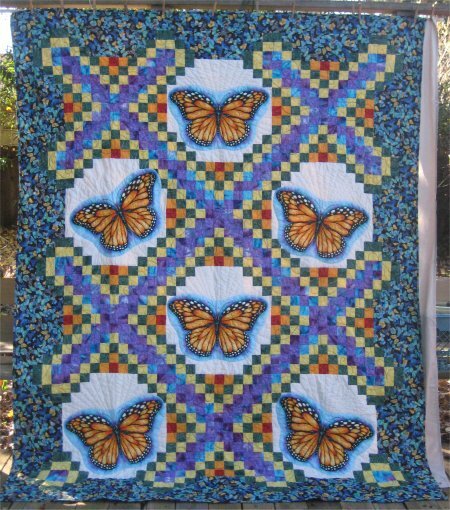 Plan B was to quilt radiating lines behind the butterfly, emanating from the center point of the block. This mostly went fine .. a few bobbles and uneven stitches, but I'm satisified with it. The wings of the butterfly have color spots. These areas were outline quilted ... although you can't see the quilting, that's perfectly fine with me because the design of the butterfly that I wanted to be emphasized, not my quilting. The outline stitches made the color spot areas kinda "puff" up. However, as with the Chain blocks, the entire butterfly block was TOO BIG for the workspace. 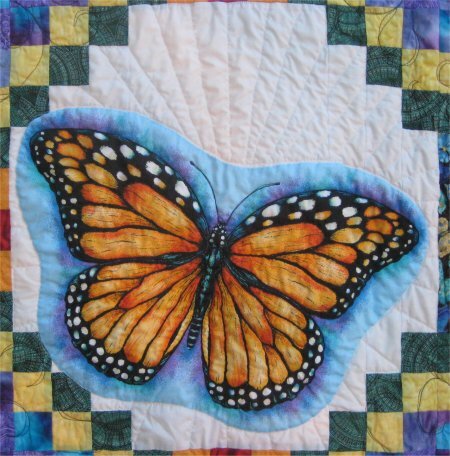 For the stitch in the ditch, the radiating background lines and the outlining of the color spots, I had to first do the upper half of the block, (move to the 2nd butterfly block, if appropriate) then advance the quilt to do the lower half. Have I mentioned this was annoying? THEN I could advance the quilt, change back to the black thread to do the next pass of Chain block swirly-curly meander routine and border meander. 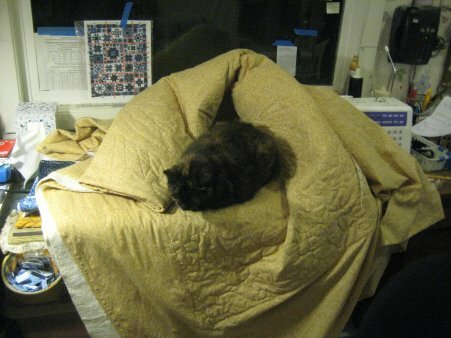 And then I got sick when half the quilt was done. :-( Man, I lost an entire week of working on it. The backing is a gold/caramel colored extra-wide backing in a paisley design. It was SO nice not to have any seams in the backing! Since I had some leftover border print fabric, I made a coordinating pillowcase, using a silky poly-cotton fabric for the body and the border print fabric for the band.